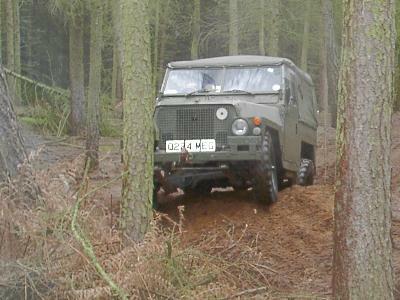 I have a military Series III Lightweight GS Land Rover which I bought in April 1995 and registered as Q224MEG. It originally entered service in February 1983 with the registration 93 KA 47 but I have not yet traced its service life. You can see some pictures of it on the Off Road page. I don’t always get stuck, it’s just that the pictures tend to get taken when I do! I’ve also attended a few military vehicle shows and even managed to feature in the photograph at the top of Shaun Connors article on the Duxford show in the October 1998 issue of Land Rover Monthly magazine. After having owned it for a few years it became obvious that the rear cross member and the chassis around the rear spring hangers was in a bad way. To cure both problems I decided to replace the rear quarter chassis. Most of my maintenance work is done on my front lawn but as this was going to take a bit longer and would require a more major dismantling I was pleased to be able to do the work under cover at a friend’s house. This also helped with the welding as my friend was rebuilding a kit car at the time and had already arranged for a welder to visit to do some work for him. I didn’t always have my camera with me when I was doing the work but did take a few pictures prior to the final removal of the old chassis. In October 2001 I purchased another Land Rover. This one is a Stage 1 V8 County Station Wagon. I had to take some photos for the insurance and although they’re not very exciting (sides, front and rear) I’ve put them into this gallery. The previous owner created a web site with more information about this vehicle and the Stage 1 in general and I have now resurrected it. I also found another web site with some useful information. When I bought my lightweight the seller had agreed to replace the faulty gearbox with one taken from another lightweight he had which had a rotten chassis. I decided to also buy the second lightweight to use as a spare parts donor and have taken several items from it such as the carburettor, radiator, gear lever, differentials and exhaust. It is an FFR and lives in a spare garage at my parent’s house. I recently took some photographs and have put them into this gallery. This picture was taken on the last day of 2003. I’d just got the Lightweight back on the road after a rather long period of neglect and thought I’d park it across the street with the Stage 1, rather than in its usual location in my front garden, so that I could admire them while I had my lunch. May 2004 – Blowing exhaust? Well it’s blowing all right but I don’t know how this happened. March 2005 – Inertia reel seatbelt in my Lightweight. A question on the uk-lro mailing list about fitting an inertia reel belt to a lightweight prompted me to take some photos of the original equipment fittings in my 1983 vehicle.